Immune system dysfunction may be associated endometriosis: hypothyroidism, fibromyalgia, chronic fatigue syndrome, autoimmune diseases, allergies and asthma are all significantly more common in women with endometriosis than in women in the general USA population. Scientific evidence shows that that immune system dysfunction may be associated endometriosis and specific immunological profiles are linked to a high probability of endometriosis. Please watch Dr. Braverman's presentation on the role of immunology in the diagnosis of endometriosis. Endometriosis affect fertility by impacting reproduction at all levels. 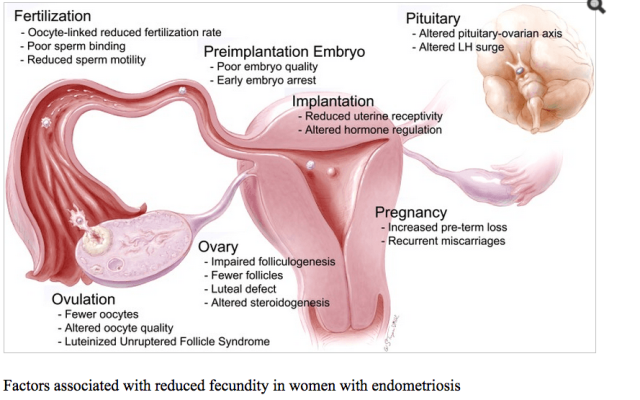 The Image below summarizes how endometriosis impacts reproduction at all levels.